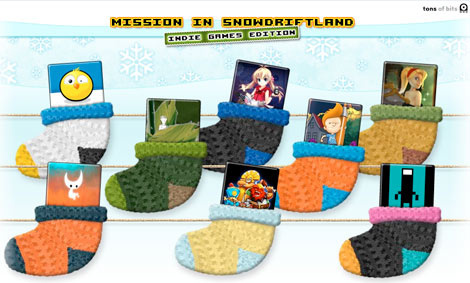 Online advent calendar Mission in Snowdriftland just opened its first door, playable online now as a Flash game, but it's the calendar's team-ups with indie developers that will bring the most cheer to hearts this Christmas. Top WiiWare and DSiWare developers have all collaborated on the project, with exclusive downloads from indie studios awaiting after each level is completed. Nnooo, Gaijin Games, Akaoni Studio, Broken Rules, Press Play and more have all contributed to the project, so there's plenty of familiar names for fans of WiiWare and DSiWare. Head over to Mission in Snowdriftland to try your hand at this festively old-school platformer, and be sure to check out chick chick BOOM from tons of bits, developers of the Flash game. A flash game for the PC? Why no (free) WiiWare release? Does this at least work with the Internet Channel? Tons of Bits have done a great job putting all of this together. A big thanks to them for including us and some exclusive Spirit Hunters Inc content. neatz, ill be sure to check it out! Yayy, the best advent calendar ever is back! Yaya! Time to enjoy the game! Btw, today's secret is chick chick BOOM. Sweet! Can't wait to try em' out. Totally will try this when I get home from work today! NOOOOOOOOOO! You revealed today's secreeeeeeeeeeeet!!!! Awesome, I loved the intro. Can't seem to get one snowflake though...is there a bonus for 100%ing the levels? I ask now before I drive myself insane as they get more difficult! ^ Yes. I only get a blank screen when trying to access the website via Internet Channel. Ooh, I'll check it out. I'm just starting to get into the Christmas spirit. Awesome!! I'll check it out later. @12: There's downloadable wallpapers and avatars, I'm assuming you need the 100% for that. You can get that last snowflake by tilting the iceberg and then jumping from the peak. I was surprised how fun that was, even though I kept dying at first. Whats spirits and 1...2...3...kick it? @12+17: I don't think so. You get the download at the end of the level even if you don't have all the collectibles. All you need to do is run through the level. I have played the level with 18 stars or so and then again with all 24 stars and nothing changed at all. If I remember right, 4 years ago, getting all collectibles in every stage got you wallpapers and music for Mission in Snowdriftland itself. The controls on this game are unbearably horrible. I can't even finish the first freaking level. Why is everyone raving over this? Controls fine for me but then I'm an awesome 2D platform gamer. @Stuffo: I'm in a similar predicament, but i think part of the problem is my laptop and the fact that it likes to hiccup from time to time. i'll try it later with an actual controller and see how it goes. It was really easy for me, maybe it's your laptop like TBD says. Wikipedia says: "...there is a reward for getting all snowflakes in every stage, and the final battle cannot be accessed until you have finished all stages" (referring to the 2006 version). It's funny how when you take a break from 2D games and go back to them later, they get so much easier. I was struggling to get some of the snowflakes and kept dying over and over again. An hour later I came back and got them all in one try. @James: I'm perfectly good at 2D platformers with controllers, but this flash game uses nothing but the keyboard's arrow keys. Up to jump is a TERRIBLE idea! And today the next world opens: Forest.